Apologies for late posting. The challange for the week over at Spiral Whisper is Cold Winter. Here is my card - I have stamped Molly with Snowman out and coloured in with Copic markers adding glitter with my Spica glitter pen. I have then cut her out and mounted to blue CS, adding to base with DST. 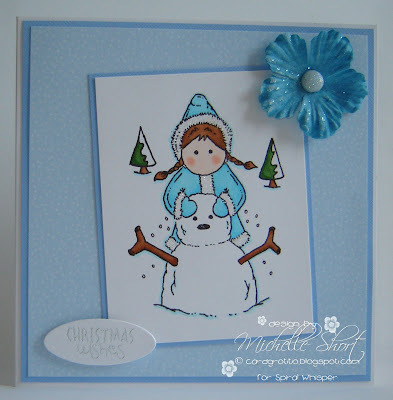 the base has been made by layering up blue CS and Doodlebug paper on to a white card blank. Craftwork Cards message and Prima Flower added with sparkly brad to finish. Check out the Spiral Whsiper blog (link on side bar) for the details to the challange and see the other DT members cards. STAMPS: Spiral Whsiper. INK: Airondack Pitch Black. CS: Anitas, Papertrey Ink, Doodlebug Designs, patterned paper by Doodlebug Designs. ACCESSORIES: Craftwork Cards mini message, Prima Flower, brad by Lakeland Ltd, Copic markers, Copic Spica At You glitter pen. ...... You cease to amaze me Michelle - another wonderful card. You have got the Copic marker colouring down to a fine art Michelle. I love this pretty card. Such a cute card! Really love the blues you've used, makes me feel all wintery! This card is beautiful!! I love everything about it! Gorgeous card Michelle! The blue is perfect with the snow!! !